Why use a panoramic camera that uses film when you can get similar results with a digital camera? The main reason is that all my production in black and white is still on film and it is the use of film that gives me the most satisfactory results. Moreover, the use of the Noblex 135U camera was a real revelation for me. The image sharpness obtained is exceptional. Although it takes a while to master its use, once used, it is a real pleasure to work with this camera. I almost always use medium format cameras (2 ¼ x 2 ¼) for shooting. The size of the film allows me to obtain a high level of detail and a better rendering of the tones that would allow me a 35mm camera. This type of camera is also much less cumbersome and less heavy than the conventional large format camera. I use an extremely fine grain film which allows me an excellent ratio of magnification. Most of all these photos were taken using a tripod to ensure maximum sharpness. I process all of my negatives as well as the printing of my photographs. I use conventional processing on high quality chlorobromide fibre paper. The selenium or gold toning, allows me to refine the tones and considerably increase the longevity of my images (estimated at about 900 years compared to only a few decades for color photos), thus conforming to or even exceeding the highest archival standards. In order to ensure optimum permanency, each print is washed using the Cross-jet Archival Washer developed by Alistair Inglis which I strongly recommend. 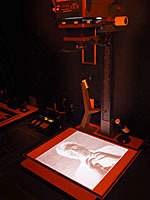 Depending on the years, the photos have been enlarged using a condenser enlarger, cold light or now with a diffusion system (dichroic VCCE). 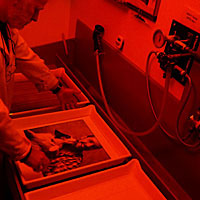 The photos are placed under acid-free mat and are held in place by plastic corners. The whole is incorporated in an aluminum frame and protected by a glass. The photo can be removed easily from the mat if necessary. All prints are limited to a series of 10 plus three artist copies. 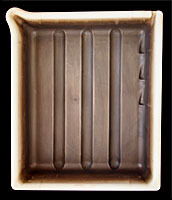 Smaller prints may sometimes be offered in edition of 25. Each photo is signed and numbered with lead on the back.